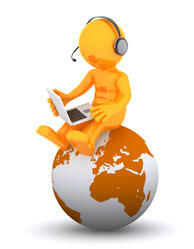 What can Unified Communications do for your business? UC is more than just a fad in modern telecommunications - it's fundamentally changing how businesses do business around the world. UC takes all your communications, regardless of origin, and turns them into data that can then be transmitted to any part of your distributed business network. In effect, this means that your employees and your customers need never be out of touch. After all, there are very few places left in the world where you can't get cellular service, and even fewer that don't have a communications satellite above them. When all your communication solutions are Internet-based data, there's no limit to where they can take you! So, let's take a look at some of the ways that Unified Communications help improve morale across your operations, including among your customers! 1 - Customers can access employees anywhere. With a UC setup, there's simply no such thing as an undeliverable voicemail, not unless your employees are hanging out on top of Mt. Everest. The interchangeability of data means that voicemails can be encoded to MP3 and emailed, or even transcribed to text to send as an SMS. The system can keep track of multiple points of contact for any employee, automatically reformatting the message for every receiving device. When your workers' messages automatically sync across all known devices, they'll (almost) never be out of contact. That translates to more sales, faster post-sale support, and happier customers. 2 - Expand your telecommuting options. With Unified Communications, there's far less reason for your workers to actually be in the office. That's not to say there's no argument for in-person communications, but working from home is much less of an impediment than it used to be. Companies with expanded telecommuting services virtually always see a boost in employee morale, because it means employees with busy lives have more options in their work/life balance. If, for example, a worker needs to be at home to care for a sick child, they can still log into the office system - or even get into a videoconferenced meeting - to keep up with their jobs. Ultimately, that helps their morale, as well as preventing other employees from having to shoulder extra work when someone takes a sick day. 3 - Put customer data in your workers' hands, anywhere. UC can also boost productivity and satisfaction in its ability to distribute your vital data. To a worker on a UC system, the words "I'll have to check on that in the office tomorrow" really don't need to be said. Universal data access means that they'll have access to customer records whenever necessary, and will be able to help clients immediately. It's not hard to see how such instant access leads directly to happier, better-served customers and clients. In an instant-gratification world, clients want their problems solved in one call, and not a day or two later. 4 - Collaborate on projects around the world. Finally, Unified Communications allow for real-time document access and editing, regardless of time or location. (Aside from Everest.) If your workers, or even your C-level executives, are spread around the world, they can still log in and all work on the same documents together. Previously, companies with remote offices had a significant problem with the local employees feeling out of the loop, or unable to contribute to decisions that affect their local conditions. Now, any form of planning or project collaboration is open to workers everywhere. Across the board, UC speeds your operations, improves productivity, and helps boost satisfaction among both your workers and your customers! And if you're going global, or you see the benefits of a distributed workforce, contact Hummingbird Networks today for more free advice and consultation on implementing Unified Communications in your office!